This screenprint and the one below, both Untitled, were created around 1960 by Austrian artist Susanne Wenger in Nigeria. They are part of a set of her works on display at the Michael C. Carlos Museum through a gift from Graham and Maryagness Kerr. © Susanne Wenger Foundation. Photo by Bruce M. White, 2014, courtesy of the Carlos Museum. "Between the Sweet Water and the Swarm of Bees: Works by Susanne Wenger" opened Jan. 23 at the Michael C. Carlos Museum and is on display through May 15. The exhibition brings together nine screen prints and one waxbatik by Austrian artist Susanne Wenger (1915—2009) in the museum's John Howett Works on Paper Gallery. The series was given to the Carlos Museum in 2014 by Graham and Maryagnes Kerr. 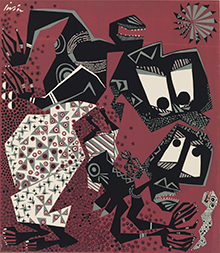 The Kerrs purchased the works from the artist at her home in Osogbo, Nigeria, in 1965. The prints, ephemera and batik in this collection are rare and have never before been exhibited together. Wenger lived in Nigeria for the majority of her life — nearly 60 years — and is best known for her revitalization of Osun-Osogbo Sacred Grove in Nigeria, which is now a UNESCO World Heritage site. The depictions in the Carlos Museum exhibition are extensions of the Osun-Osogbo Sacred Grove. They are syncretic compositions of oriki, which is praise poetry about Yoruba deities such as Obàtálá and Osun, and of European mythology. The Yoruba, an African ethnic group, dominate the western part of Nigeria. The prints and batik "are not exactly illustrative of a particular story or deity," according to Amanda Hellman, curator of African art at the Carlos Museum. "The colors and patterns look like a 1960s aesthetic," says Hellman, "but the angular figures are definitely her style. I think it is fair to say that a viewer can find imagery and symbols that are a part of a Yoruba visual culture, and imagery and symbols that are part of a European visual culture." As curator, Hellman included praise poetry in the exhibit, less because the poems go with the art than because they "evoke images and emotions found within." "There are few of Wenger's 'portable' artworks available and the works given by the Kerrs are in incredible condition," says Hellman. "I think this is an interesting exhibition because the works demonstrate her unique connection to Yoruba culture as a priestess of Obàtálá and the way she blended her understanding of the stories of the Orisa with European stories and imagery." Six months after Wenger arrived in Osogbo, she fell ill with tuberculosis. She attributed her recovery one year later to the god Obàtálá and not only created work depicting his stories, but also became a priestess in the Obàtálá society. "She was a priestess of the Orisha, Obàtálá, so she and her followers would say her work is divinely inspired," Hellman notes. "I think her service to art education and Yoruba culture is the element that makes her work so important. Her art is a direct result and expression of that dedication," she says. Hellman thinks this exhibition of Wenger's work provides a glimpse into a particular moment in Nigerian history. "These prints were created right after Nigerian independence and right before the Biafran war," she says. 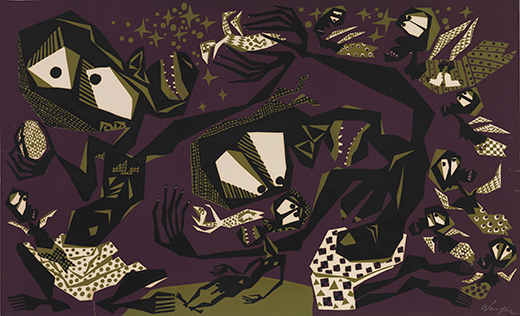 In addition, her art and her workshops helped shape the idea of modern art in Nigeria. "She taught many of the most well-known modern Nigerian artists, including Twins Seven Seven, Nike Davies Okundaye, FAB," Hellman says. Several events related to the Wenger exhibition will be held at the Carlos Museum. On Tuesday, Feb. 2, Jessica Stephenson, assistant professor of art history at Kennesaw State University, will introduce visitors to the life and art of Wenger though her silkscreen prints featured in the exhibition. This gallery talk, which is free and open to the public, will be at 7:30 p.m. in the Works on Paper Gallery. "The Silkscreen Art of Susanne Wegner," a workshop for K-12 teachers, will be Thursday, Feb. 18, at 5 p.m. in the Tate Room of the museum. A silkscreen printing workshop for adults is Saturday, Feb. 27, from noon to 5 p.m. in the Tate Room. Led by artist Deborah Sosower of the Atlanta Printmakers Studio, participants will examine Wenger's imagery and technique, then create their own compositions using screens inspired by Wenger's prints. For more information on these event, see the Carlos Museum calendar.